supplies products which are used in preparing, manufacturing, and finishing of textiles. The key items produced by the industry include Textile Processing Machinery and Textile Working Machinery, Equipment & Accessories. Those machinery which are used for processing the raw materials or for manufacturing finished textile or textile accessories are called Textile Processing Machinery. Some of the examples may be cited as Crochet Machines, Knitting Machines, Lace Making Machines, Quilting Machines, Textile Finishing Machines, Tufting Machines, Textile Weaving Machines, Textile Spinning Machinery etc. The other category viz. the Textile Working Machinery Equipment & Accessories include those machinery which assist in the main function of textile manufacturing. It also includes the parts and accessories required for the textile processing or working machinery. The examples are Applique Sealing Machines, Cloth Cutting and Measuring Machines, Embroidery Machines, Garment Steamers, Laundry Dryers, Sewing Machine Needles, Textile Cleaning Guns, Textile Folding Machines, Textile Trimmers etc. The Industrial Revolution in the United Kingdoms during the period between 1750 and 1850 gave birth to Textile Machinery. The textile industry of the UK was facing stiff competition from the weaving industry of Asia particularly from the Indian weavers. Thus a systematic development of textile industry with spinning and power loom machinery was initiated in the UK. This industry was developed and nurtured by the various governments in the UK and later by Germany and Switzerland followed by other European countries. 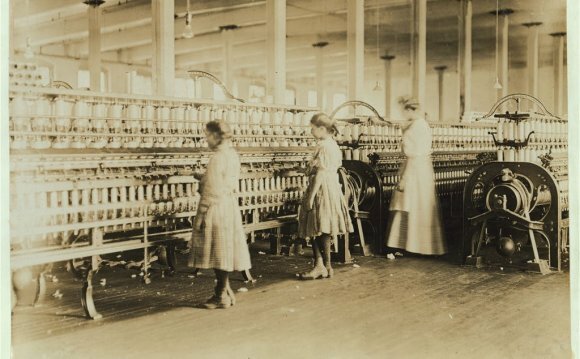 During Industrial Revolution, many inventions in textile Machinery occurred. These inventions are the foundation of todays flourishing Textile Industry. In 1733, Flying shuttle was invented by John Kay which was an improvement upon the then existing loom. It made faster weaving possible. In 1764 Spinning jenny was invented by James Hargreaves. This was an improved version of the spinning wheel. In 1779, Crompton invented the Spinning mule which resulted in greater control over the weaving process. In 1790, the first steam powered textile factory was established by Arkwright in Nottingham, England. The Cotton gin was invented by Eli Whitney in 1792. This machine automated the process of separation of cottonseed from the short-staple cotton fiber. In 1804, Joseph Marie Jacquard invented the Jacquard Loom that made weaving of complex designs possible. In the 20th century, many developments and improvements were made in textile machinery production. Electronics, automation and robotics became the new trends which resulted in more productivity with less labor and operation costs. Today innumerable machines are there in the market for as basic a function as spinning to the most advanced function of decorating textile like embroidery. Without spinning one cannot think of textile. The spinning machines have come a long way from spindle and spinning wheels to the most advanced technologically enabled spinning machines. Ring spinning machines are used to simultaneously twist staple fibres into yarn and then wind it onto a bobbin for storage. All the basic procedures like blending, carding, combing, drawing etc. have to be done when using ring spinning method for spinning fiber into yarn. In Open- End Spinning machines, the sliver (fiber after it has been combed), is opened and the loose fibers are fed by an air stream into a turbine. There.its centrifugal force builds up layers of fiber which are twisted and drawn off and wound on spools. In Friction Spinning Machines, a rapidly rotating card drum opens the sliver to single fibers. The inbuilt inlet system provides for the retention and the drafting of the fiber band. The centrifugal force strips the single fibers from the card drum and, supported by the air current, the fibers are blown into the nip formed by the two perforated spinning drums. Vortex Spinning Machines are a variation of the Open- End Spinning machines. Here, the rotor is eliminated and is replaced by a tangential air inlet that draws fibers down a tube. As yarn is rotated in the air stream, a twist is inserted causing the fibers to grasp onto each other forming a continuous yarn. Air Jet Spinning Machines draft the sliver to a predetermined size and passes it through rollers over a friction plate (to prevent back twist) into a cylindrical pneumatic twisting chamber. Jets are set in the walls of the chamber which release compressed air to the central axis of the tube and the fibers are whirled around each other giving them either an S or Z twist. The strand is passed to a second chamber where it is first stabilized and then given an equal amount of twist in the opposite direction producing a yarn of uniform diameter without thick or thin areas. In Wet Spinning Machines, an appropriate liquid solution is pumped through small nozzle, called spinneret, into a chemical bath that coagulates the extruded solution to endless strands of filaments. These coagulated continuous fibers are drawn out of the bath, purified by washing, dried and then wound onto spools. Spinnerets are also of two types. One type of it has one extrusion hole and it produces a monofilament yarn. The other type has many holes which produces a multifilament yarn. In Integrated Composite Spinning Machines, monofilament or multifilament strand is fed through a molten polymer or copolymer resin. Staple fibers from the slivers are superimposed and press bonded to the polymer coating. This is given a retained twist while still heated by a false twist device and then cooled and wound on spools. Coverspun Spinning Machines are a type of integrated multicomponent yarn spinning machines. This machine uses the technique which wraps fine continuous filaments fiber around a core of untwisted staple fiber to produce yarns in a wide range of counts. The staple roving passes through the drafting rollers into the hollow spindle on which the filament spool is held. Although there are variety of stages in textile formation between spinning and embroidery, the following description about the embroidery machines intend to bring out the vast span of textile machinery used today. Embroidery machines are categorized on the basis of function, size and usage. It is meant only for embroidery and are mostly used with sewing machines for creating simple embellishments. It is portable and are mostly used as domestic machine by hobbyists. It combines sewing as well as embroidery features. It is useful for small scale professionals like tailors, sewers or custom embroidery service providers. These machines have multiple needles for working with different threads. They are capable of creating complex designs without having to switch needles or change threads. They are usually bigger in size and difficult to operate. As such they are useful for commercial and heavy use.